I did it, I wrote consistently 30 of 31 Days. I enjoyed reading and reflecting on the book of Sirach this month, but I think some of my favorite posts from the month have been the last couple where I considered a good wife. One of my purposes in writing is to encourage women to take every thought captive to Christ and stop being a slave to negative thoughts. Daily affirmations can play a huge part in overcoming negative thinking. 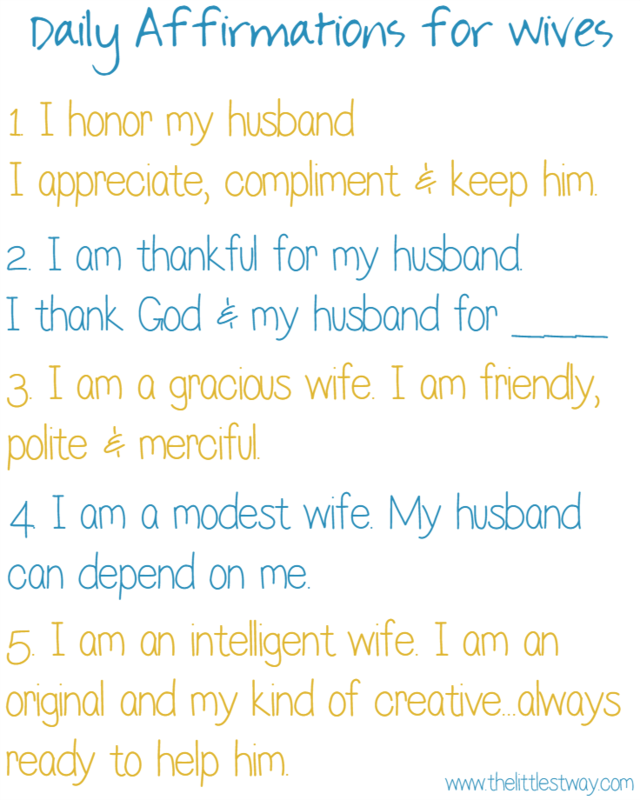 So let’s pull together some daily affirmations for wives.
. But reading about a good wife is not enough. We have to desire to become one and then take steps to make it happen. One of the easiest and most fruitful steps to becoming a good wife, is to start speaking of ourselves as a good wife–daily affirmations for wives. These affirmations need to be said repeatedly. Remember the whole “making new pathways in our brains” discussion we considered in “What Does the Bible Say About Our Thoughts.” Well, it applies here. Just as an experiment, for the next week, let’s repeat these daily affirmations for wives at least twice a day, morning and night. Repeat them with an open mind and tender heart, asking God to make us the wife He created us to be. Also, anytime during the day we start to feel frustrated, angry or resentful with or toward our husband, let’s start saying these affirmations, preferably out loud. Also, where it says “husband” say your husband’s name. Remember, these affirmations are not to change our husband. He will most likely be the same guy in one week as today. These daily affirmations are to change us. They are to change our heart, our thoughts and our words about our husband. We are fighting fire with fire here. If we have been negative or sloppy in our thoughts and words about our husband, the purpose of saying these affirmations are to make us positive and intentional in our thoughts and words. 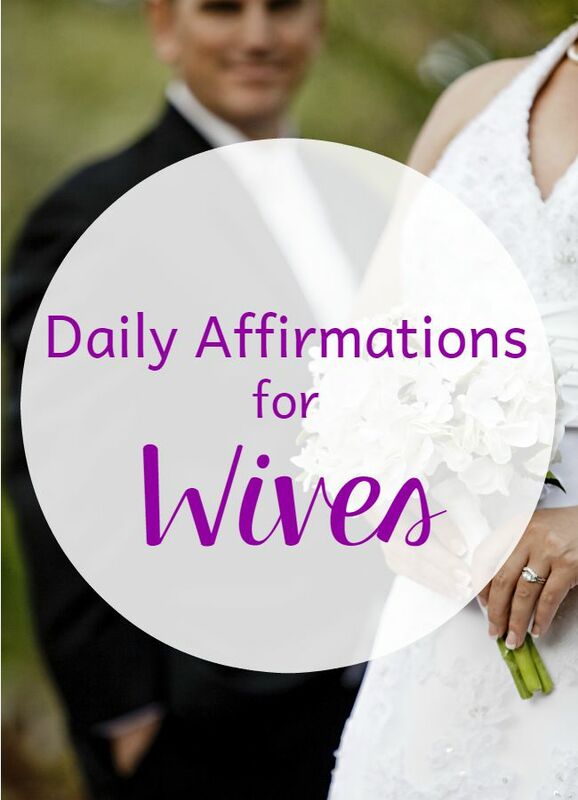 If you are joining me for the next week in my daily affirmations for wives challenge, let me know in the comments. I would love to know I’m not alone in desiring to become a good wife. Click here to read more posts about a good wife. I came by from my email and was clicking around, and thought it was high time to thank you for your generosity and example! You are so right! When we change our thought life, we can make huge changes in our marriages – without changing our husbands at all! Thank you for this post!